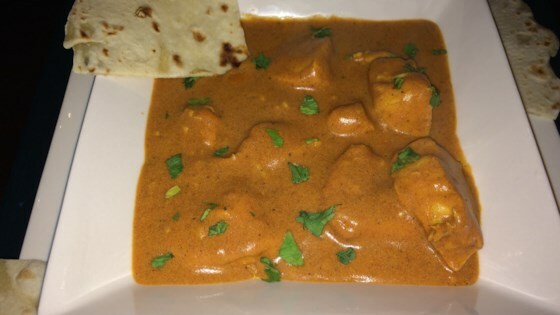 "Simple and absolutely irresistible chicken tikka masala made in the Instant Pot® with all the flavors of garam masala and turmeric. A wonderful and easy midweek dinner option." Combine chicken, yogurt, garam masala, lemon juice, cayenne pepper, and ginger in a bowl; toss until fully coated. Cover and refrigerate for 1 hour. Turn on a multi-functional pressure cooker (such as Instant Pot(R)) and select Saute function. Add chicken with marinade; cook until tender, stirring occasionally, about 5 minutes. Place tomato sauce, garlic, garam masala, paprika, turmeric, and salt in the pot; stir until well combined. Close and lock the lid. Select high pressure according to manufacturer's instructions; set timer for 10 minutes. Allow 10 to 15 minutes for pressure to build. Release pressure carefully using the quick-release method according to manufacturer's instructions, about 5 minutes. Remove lid and select Saute function. Pour in cream; stir well. Simmer until sauce has thickened, about 4 minutes. See how to make this top-rated recipe for spiced chicken in a tomato cream sauce. I made this according to recipe along with the cheddar biscuits and I love it! I will definitely make it again!! Best ever! My husband loves it! This was great! It was a little spicy for my taste, so I may reduce the cayenne pepper next time. Definitely will make this again.